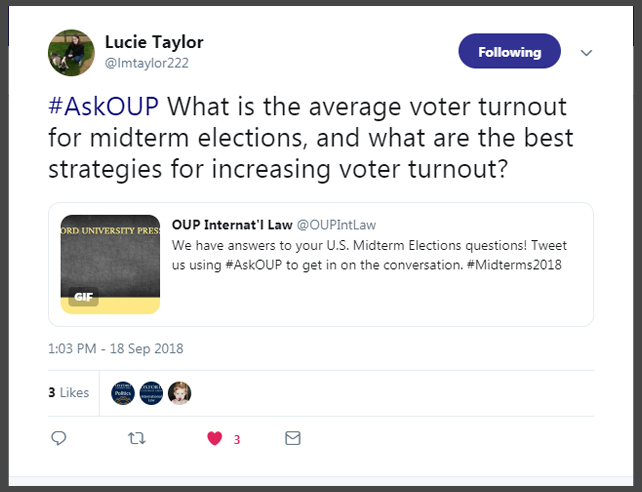 In September, we asked our followers to send us questions regarding the US midterm elections using the hashtag #AskOUP. We compiled a list of our favorite questions and answered them below. How many seats do the Democrats need to regain control over the House and Senate? In order for the Democrats to gain control over the House, they would need to see a net gain of 24 seats. To regain control of the Senate, Democrats would need to keep all of their seats and capture two of the Republican seats for a 51-49 majority. Of the seats up for election, 35 are held by Democrats, and nine are held by Republicans. What is the average voter turnout for midterm elections? In Denmark and Germany, turnout in typical elections for the legislature averages between 70 and 90 percent; in Poland and Switzerland, about 50 percent; and in recent US elections, around 36 percent have voted in midterm elections and about 50 percent in presidential. How serious of an issue is voter fraud? What is being done to prevent it? We know surprisingly little about exactly what types of registration and voting procedures pose trade-offs between maximizing access and preventing electoral fraud, and what areas of election administration provide opportunities to pursue both goals simultaneously. Some scholars are circumspect about the trade-offs between these goals, arguing that there is no tension between inclusion and security, at least concerning certain policies like voter identification, Election Day, and early voting. Some argue more broadly that “efforts to make it easier to register and vote are compatible with the prevention of election fraud.” Yet comparative research shows that some efforts to clean up elections have the potential to disenfranchise some voters, and in the US popular concerns about voter fraud and partisan acrimony over voting procedures persist. Concerns about voter fraud continue to be used to justify not only voter identification policies but also regulations on voter registration drives and cutbacks in early voting. Because partisanship surrounds contemporary debates over election administra­tion procedures, it can be difficult to distinguish between strategic efforts to shape voting rules for partisan advantage and genuine ideological or pragmatic differences over competing goals of electoral integrity. It is thus important to have evidence-based analysis of how different election administration practices affect voter access and election fraud. 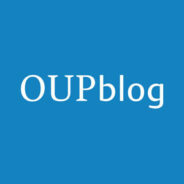 #AskOUP question about the midterm elections asked on Twitter. Image used with permission of @lmtaylor222. Are there still systems and laws in place that affect the way votes are cast and counted? How votes are aggregated through any electoral system affects political outcomes. Single-member district systems tend to distort vote shares into seat shares more than other representational systems, to the detriment of non-geographically concentrated minor political parties. Those who control redistricting can further manipulate these distortions to their advantage through a strategy known as gerrymandering. In the theoretical extreme, it is possible for a political party that receives a quarter of the votes to win half of the seats, if it arranges its supporters such that they constitute a bare majority in half of the districts. The distribution of partisan supporters among districts may also be manipulated by varying the number of persons within districts, a practice known as malapportionment. Prior to the 1960s, state legislators—who often have primary authority to draw district lines—were loath to redistrict, since this upset connections between representatives and their constituents. Inaction created “creeping malapportionment,” whereby fast-growing urban areas were incrementally afforded less representation than slow-growing rural areas. Redistricting must now occur in a timely manner, following a national decennial census, although state laws dictate whether states may redistrict more than once between censuses. Does political polarization pose a problem in US politics? Prior to the 2018 midterm elections, an unusually high number of incumbent Republican senators and representatives announced that they would retire from Congress rather than seek re-election. Polarization was not the only factor at play. Some were facing increasingly competitive elections and the possibility of losing the power and leverage of being part of the majority party. However, increasing polarization and acrimony in Congress was a frequently cited factor, accentuating the fact that this is a conspicuous and unfortunate aspect of political life in the United States today, even among those who have at times helped to further and deepen legislative polarization. I feel like today’s news cycle jumps from controversy to controversy. How can we better communicate when it comes to political policies? Politicians cannot work together, at least partly because they do not understand each other. Opponents will never agree to bear their share of the burden if they do not understand why that burden needs to be carried. This lack of understanding might sometimes result from incommensurable world views or conflicting assumptions that prevent mutual comprehension. However, political opponents too often do not even try to understand each other, partly be­cause they see no personal or political gain in reaching out and being fair. Indeed, they often have strong incentives neither to reach out nor to be fair. Tweeters and bloggers go wild on the Internet, because their goal is to gain likes for their jokes and gibes. They receive few such rewards on the Internet from balanced attempts to see the other side in contentious debates. Why should they try to understand their opponents when they think that they are bound to fail and get nothing in return for their attempts? Admittedly, many interesting and insightful conversations do occur on Twitter and the Internet, but the huge number of lurking trolls scares off many potential contributors. When they give up on understanding, they turn to willful misunderstanding and misinterpretation. Arguments do little good when the audience is not receptive, so we also need to learn social skills and habits to encourage our audiences to be receptive to reasons. Featured image credit: Vote Voting Ballot by mohamed_hassan. CC0 via Pixabay.